All widowed Clare Armbruster needs is her brother’s signature on a legal document to be free of her past. After a failed marriage, and still mourning the loss of a child, she’s had it up to her ears with the assumptions she doesn’t know how to take care of herself, that what she needs is a husband, and with a great lout of a captain who can’t figure out what to do with his daughters. If only the frightened little girls didn’t need her help so badly. Clare has made mistakes in the past. Can she trust Fred now? Can she trust herself? Captain Wheatly isn’t ashamed of his aristocratic heritage, but he doesn’t need his family and they’ve certainly never needed him. But with no more military career and two half-caste daughters to support, Fred must turn once more—as a failure—to the family he failed so often in the past. Can two hearts rise above past failures to forge a future together? Fred first appeared as a boy in A Dangerous Nativity, along with his brother Rand, who is now a timber baron in upper Canada, and his cousin Charles, a duke who is a powerful government official with interests in places from Philadelphia and Madras to Canton, China. Top Pick Take the journey with Fred and Clare and see what is in store for them. This is another wonderful book by Caroline Warfield and I cannot wait to read more. The interaction between Fred and his children tugs at the heartstrings, and the courage and patience of Clare will have you rooting for Fred and Clare as a couple long before they realize how strong is their attraction. 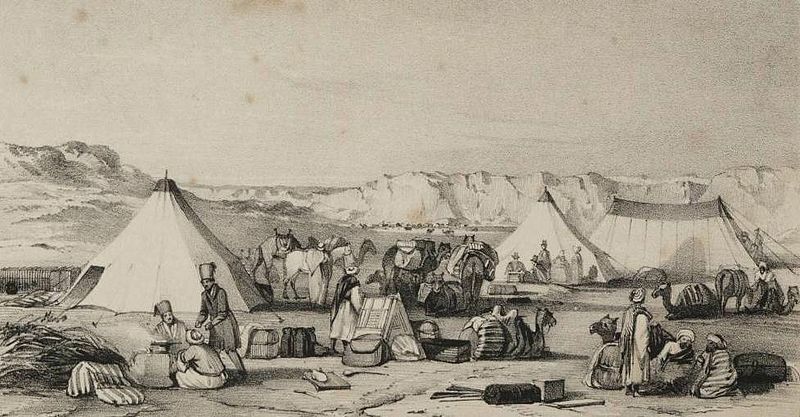 Bivouac in the desert: they traveled to England via the “camel route” to Meghal’s delight.